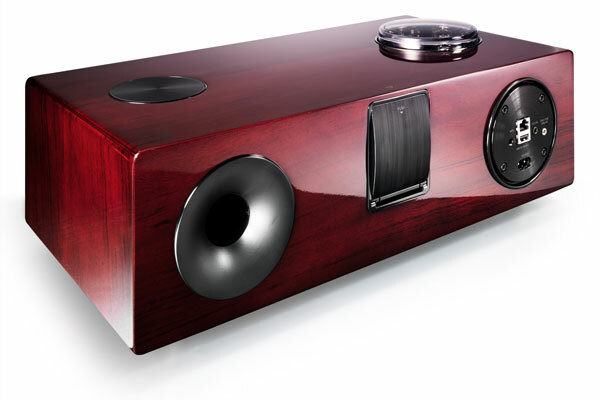 Samsung’s ‘valve’ wireless speaker system is visually stunning, but the sound could do with a tweak here and there. WHEN SAMSUNG’S DA-E750 wireless speaker system arrived, I was taken aback by the size and weight of its box, which seemed too big and heavy for a device of this type, but it was only when I extracted the E750 from its packaging that I registered that this thing is built like a brick dunny. At nearly 10 kilograms, this is a heavyweight in a world of bantamweights but unlike small brick buildings, it’s also a thing of beauty. It doesn’t have the curvaceous elegance of a B&W Zeppelin or the Star-Wars styling of Monitor Audio’s i-deck, but the Samsung’s styling is understated yet purposeful. 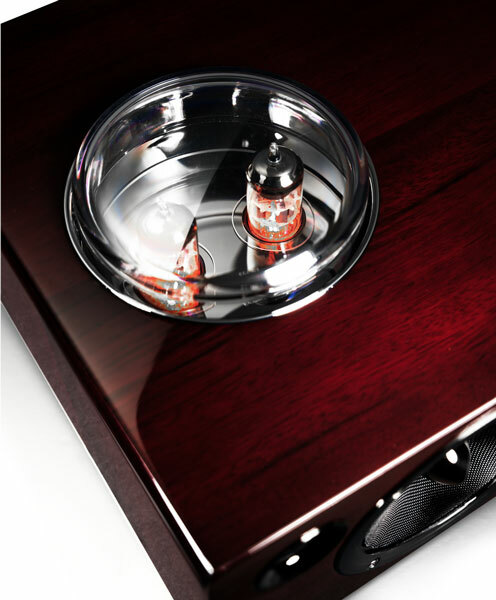 The build-quality is quite amazing – this is no ‘plastic-fantastic’ device: from the fit of the various sections and the glow of the valves in the glass pod on top to the ultra-gloss mahogany finish, it looks and feels every inch like a superior product. Heck, even the bottom of the E750 is well finished, the packaging classy, and the cable tie around the power cord branded. There’s no doubt that a lot of time and effort went into this design. It’s a fully featured product too. Not content to merely serve as a digital iPod dock, the E750’s dual dock has a micro USB dock for Samsung’s Galaxy smartphones (it’ll also dock certain other Android phones). The E750 also offers a 3.5mm aux input, USB playback, along with apt-X Bluetooth v3.0, AirPlay and AllShare (Samsung’s content sharing service) streaming. There’s even an Ethernet port for those who want to hardwire the E750 to their network. 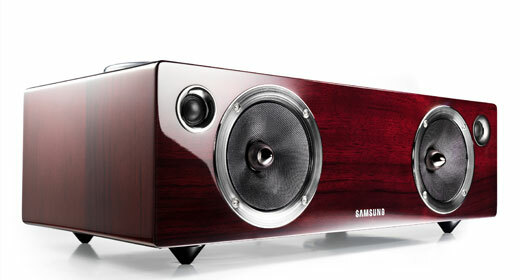 DAB and FM/AM tuners would have elevated the Samsung but all things considered, that might be getting picky. For owners of certain Samsung TVs, the E750’s SoundShare feature can stream sound directly from the TV to the speaker wirelessly, effectively morphing it into a stylish soundbar (assuming there’s space for it near the TV, because it’s about the size of a conventional centre speaker). In addition, there’s an App (Samsung Wireless Audio with Dock), which enhances the functionality of the E750 when used certain Galaxy and Android devices. The dual dock is a work of genius. Not only does it seamlessly support two types of device, it also slides back into the E750 when it’s not in use. Initially, I was less than impressed with the fact that the back of the devices weren’t supported, but a quick look at the manual revealed that Samsung elegantly took care of this with a support that also slides up when it’s needed. The aforementioned valves dwell in a thick glass dome so they’re well protected but prominently displayed. According to Samsung, they’re there to recreate ‘the harmonic sound elements’ and to produce ‘a rich and warm experience’. This is a hybrid amplification system, combining the valves in a preamplifier capacity with Samsung’s ‘Crystal Amplifier Plus’ technology, which I’m told is a Class D amp with a built-in Digital Signal Processing system. The speaker drivers on the front panel are described as premium glass-fibre units with phase plugs, which are backed up by two small tweeters. And then there’s a bigger ‘subwoofer’ driver on the bottom of the unit. The left and right channels get 20 watts of power each, while the woofer gets fed 60 watts. The Samsung is missing a dedicated display – sources are shown as little icons in the neat control panel on the top of the unit, but that’s no help if you’re cycling through them from across the room with the remote, vainly trying to activate the Bluetooth or select the USB input. a) Apple is the evil opposition, so too bad for Apple users. b) Most users will control their E750 directly from a streaming device or computer rather than docking their devices. There’s a slight delay when you turn the power on because the valves need to warm up, so the E750 cycles through the display icons before everything comes to life. From the first notes it’s obvious that Samsung hit the nail on the head with the ‘rich and warm’ description, because the E750 is nothing if not warmly balanced through the upper bass and midrange, despite the presence of a digital amplifier. The cabinet is big enough to give the speakers and the port loads of air and they’re obviously being fed with plenty of clean power, so the sound from the midrange up is vibrant and refined. The E-750’s tweeters make their presence felt, but are never intrusive, so the high frequencies are extended and clear, albeit with a touch of hardness. The ‘subwoofer’ on the other hand needed a serious smack upside the head and instructions to chill out, because its contribution to proceedings was well over the top. Initially, the bass wasn’t just overwhelming but it was also disconcertingly slow, sounding as if it was running behind the timing of the music. After some running time, the low end settled down and became more cohesive, but the lowest notes were always dominant. Playing ‘Songbird’ from Bernard Fanning’s Tea And Sympathy album showed the paradox that is the E750– the initial guitar notes were well defined, with a lot of space around them and a good amount of detail in the sound of the actual strings. However, as soon as the drum started up, the woofer kicked in with a huge ‘doof, doof, doof’ that overpowered the vocal and left the track sounding quite out of sorts. The more the volume was pushed up, the more noticeable the heavy bass became. This persisted with any type of music I tried and I was ready to write off the E750 as a lovely looking but awful sounding failure. However, my colleague Gary Steel had a unit at the same time I did and his review was actually very positive. Now, Gary and I have very different taste in music but I’m convinced that he’s not hard of hearing, let alone stone deaf, so I asked him to send me his review unit so I could be totally sure. When I fired up the second sample, I noticed that the bass was more under control and far better integrated into the overall sound. There was still a degree of overhang and the sense that the woofer and the big rear reflex port were running fractionally behind the flow of the music, but this wasn’t anywhere near as annoying as on my first unit. I had Ruark Audio’s R4i in (reviewed here) while I had the E750, and while the R4i is a far more expensive unit with a built in CD player, the form factors are much the same, right down to the two front drivers and bottom-mounted woofer. 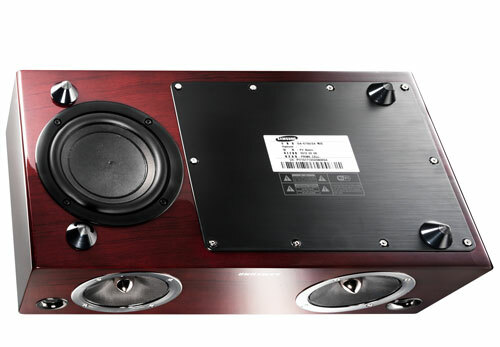 The R4i however, has a ‘sub-level’ knob on the back, which allows the user to adjust the output of the woofer as needed. The E750 could use a similar facility to allow users to tweak the bass to their preference – the bass button on the remote turns the bass up dramatically, which is a bad plan on this device. While I never quite came to terms with the woofer’s integration, the E750 put on a commendable sonic show, offering impressive clarity from the upper bass through to the top, and plenty of grunt. The sound is rich and quite dynamic but the E750 can’t quite match the audio goodness of B&W’s Zeppelin Mini (reviewed here), despite the difference in form factors, and it doesn’t go as loud or punch as hard as NAD’s VISO 1 (reviewed here). It kills them both on looks though. I ran the E750 via iPod, iPhone and Bluetooth but I hit a snag setting up the WiFi access, where the E750 just wouldn’t talk to my router. Running out of time thanks to all the hours spent trying to get the first unit to sound right, I decided to just listen to some music from my phone instead, because in my experience, AirPlay sounds better than Bluetooth but not as good as a docked iPod. I’ve not read any other complaints about wireless set up, so I’m willing to ascribe this glitch to a localised issue on my network. Pity, as it’s a cool looking piece of kit. However for the money, it should at least be robust, let alone offer sound quality worthy of its hype.